Women have a lot on their plate. From dealing with stress at work and home to carting around family members and running errands, carving out time for yourself can be hard. Implementing a schedule to work out is one amazing way to not only take time for yourself but to also help you center yourself, improve your life, and help you to achieve and maintain the best level of health possible. The right women’s gym bag is an excellent tool to make hitting the gym easier than ever while staying organized and focused. We tested and reviewed the top women’s gym bags to help you find the best bag for your money. We have also handcrafted a special buyer’s guide that is brimming with knowledge to demystify the purchasing process. Let’s get started! 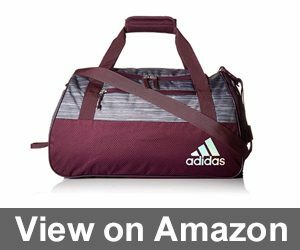 How Do I Pick the Best Women’s Gym Bag for my Needs? 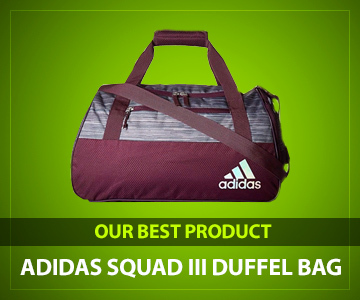 The Adidas Squad III Duffel Bag is one of the most durable bags our testing team reviewed. The bag even comes with a lifetime guarantee, making it a sound decision for anyone who can sometimes be a bit rough on their gym equipment. This option has been meticulously crafted from a strong and fashion-forward polyester fabric that will last through heavier use. The Adidas Squad III Duffle Bag has a roomy main compartment perfect for toting clothing and gear. The bag also has an adjustable shoulder strap, a cushioned pocket for your digital devices, a key fob, and lots of pockets for stashing smaller items. The bag is available in many gorgeous colors and patterns to suit any style preferences. 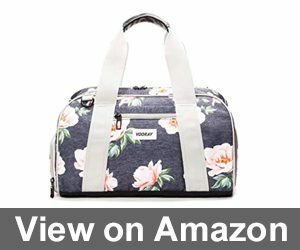 The Vooray Burner 16 Inch Compact Gym Bag is one of the loveliest bags our testing team members were able to review. The bag comes in several beautiful designs including several different hued prints featuring roses, a bold black marble look, or delicate cherry blossoms. The Vooray Compact Gym Bag truly lives up to its moniker thanks to a length of just 16 inches, helping it fit into smaller gym lockers. The Vooray Burner 16 Inch Compact Gym Bag includes a faux fur-lined pouch dedicated to protecting your electronics. The handles are magnetic to keep you from accidentally losing anything or having the contents of your bag spill it in case of a drop. The base of the bag features a rugged hard-shell base that is water resistant to protect your gear. The Nike Women’s Gym Club Duffel Bag earned our testing team’s highest marks. The bag is available for purchase in many different shades to delight any personal preferences. If durability is a top concern, then this bag definitely fits the bill thanks to its excellent craftsmanship and polyester material. This beautiful offering from Nike includes an internal divider to make getting and staying organized a breeze. You can safely place smaller valuables in any of the interior pockets to safeguard while you work out. The bag is plenty large enough to include everything you need while still easily sliding into your gym locker. This option can also pull double duty as a weekend travel bag as well. 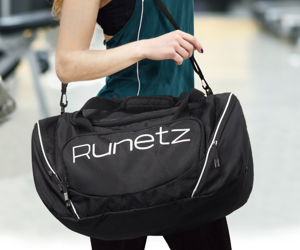 The Runetz Gym Bag is a functional and easy on the eyes option that is as affordable as it is stylish. The bag is designed with a shoulder strap that is both detachable as well as being adjustable. Our testing team loved using the bag for this reason as it makes the bag more easily accessible and useful for lots of activities. In fact, one team member’s daughter “borrowed” the bag while home on break from school to use as a workout bag and a bag for packing for weekend trips. 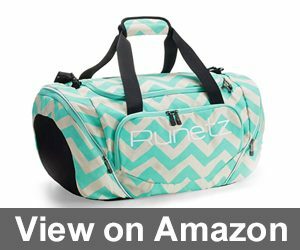 The Runetz Gym Bag is available in a few options including a lovely chevron pattern in teal, bright pink, grey chevron, and black. This bag is extremely lightweight so it won’t be a pain to cart around after a long session at the gym. We were also delighted by the ventilated pocket on the Runetz Bag which comes in very handy when carrying sweat drenched clothing or wet swimming suits. 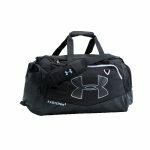 The Coreal Sports Gym Duffle Bag is a wonderful option at a very low price. The bag is available in several fun colors and includes a special compartment to store your working out sneakers in. This is also a very durable option thanks to a wear and tear resistant ripstop nylon. The Coreal Sports Gym Duffle Bag is very light to carry which was a big selling point for our testing team members. The shoulder strap is both removable and adjustable to provide comfort. Individuals with back pain or mobility concerns will love how easy the bag is to maneuver. The Forestfish Women’s Lightweight Gym Tote Bag was a hit among our testing team members thanks to its cross body style and versatility. The bag can be carried as a crossbody gym bag, it can be used as a travel shoulder bag, or the hand straps could also carry it. This level of customization is perfect for individuals with pain or mobility concerns. The Forestfish Women’s Lightweight Gym Tote Bag is created in several colors including lime, bright blue, and black. The bag is super light to carry and thanks to its nylon material, it’s also water-resistant making it an awesome choice for swimming. You’ll get an inner bag with a zipper, two zippered front pockets, and two side pockets to aid in keeping you as organized as can be. The Everest Gym Bag makes staying hydrated while working out easy as can be. The bag features a water bottle pocket front and center. Our testing team loved that the bag helps to remind them to drink water and also has a ton of space to fit all of your essential items. The bag has a side pouch for wet items or stinky tennis shoes, a padded water bottle holder, a very spacious clamshell opening main storage spot, front zippered pockets, and a large mesh side area. 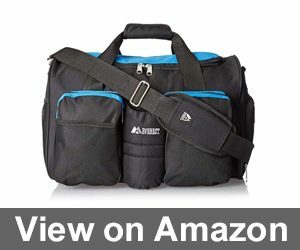 The Everest Gym Bag is as inexpensive as it is functional. Our testing team liked using this gym bag for working out, for school, for trips, and for work as well. With an adjustable shoulder strap, the Everest Gym Bag is also very comfy to carry. The MIER 20-Inch Sport Bag is the perfect solution for busy professionals. The bag is available in a bright pink or traditional black. This option has a special pouch to house and protect your tablet or laptop while you work out. This gym bag offering from MIER is crafted from heavy-duty nylon with a 210-denier lining. The bag is not only well-made, but it’s been built to last through heavy use and grueling commutes. This option would be terrific for travel as well thanks to its shoe compartment and zippered enclosure. The WEWEON Gym Bag features a traditional duffle bag design. The main compartment is very spacious to contain your workout essentials or for a weekend getaway. The bag even includes a vented pocket on one end where you can place wet clothing or shoes. 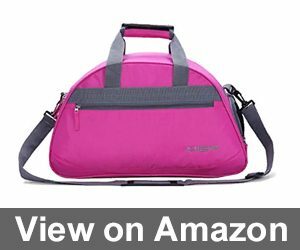 The WEWEON Gym Bag is available in several fun colors including black, blue, green, and pink. The bag is also perfect for anyone short on storage space since it folds up compactly. The adjustable shoulder strap is removable as well to customize carrying style. 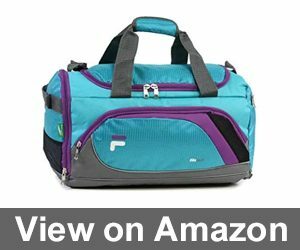 The Fila Advantage 19-Inch Sport Duffle Bag is the perfect women’s gym bag to pull double duty. Our testing team members enjoyed using this bag for everything from working out to hockey practice to traveling. 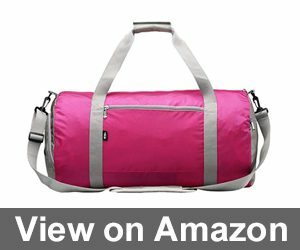 In addition to its amazing versatility, this gym bag is also inexpensively priced. This sports bag offering from Fila has a secret shoe compartment to shield clean clothes from not-so-fresh shoes. The bag has been created using 600-denier ripstop nylon, so it will last for years to come. With an adjustable shoulder strap that includes padding, this is also an easy bag to carry for longer periods of time. Women are busier than ever with work, school, daily responsibilities, and so much more. Carving out time to exercise is difficult enough without also trying to figure out what type of gym bag to carry. The sheer number of women’s gym bag options currently available for purchase is enough to make anyone’s head spin. During our testing time we learned a great deal about the most important features to watch for in a women’s gym bag. As a result, we have handcrafted this buyer’s guide to demystify the purchasing process. So, without further ado let’s take a look at what makes for the best women’s gym bag. All gym bags were most definitely not created equal. Let’s explore the features that matter most. A gym bag needs to be large enough to hold your gear and extra clothes. Conversely, a too-large gym bag won’t be easy to place into your gym locker or carry around. You may need to double check the dimensions of your gym’s lockers to ensure an over sized option will still fit comfortably. If you are heading to your favorite exercise class, you’ll need water. Selecting a women’s gym bag that has dedicated spots for water bottles can be extremely helpful. Zippered pockets with soft inner linings are terrific for safeguarding smartphones, tablets, earphones, and much more. Many of the women’s gym bags we reviewed had breathable mesh sections. These storage spots are perfect for stashing your sneakers in. This type of pocket is also a wonderful idea for individuals that enjoy swimming or other water-centric sports since it will assist in avoiding mold or mildew penetrating your clothing, towels, or other essential items. There are a few commonly used materials in the construction and design of women’s gym bags. Here is a closer look at the most common fabrics utilized. Canvas: Canvas is a lighter material often used in the construction of bags. This option costs less than other options and creates a bag that is light and easy to tote around. This option is most often crafted from tightly woven linen or cotton fibers. Canvas is also easy to care for. It is less expensive than other materials and makes a lighter, easier to handle bag. Nylon: Nylon is another wonderful fabric option. It is inexpensive and can be constructed in a plethora of colors and patterns. Nylon is very lightweight and easy to clean and maintain. It does have a tendency to rip or tear so you will need to be somewhat cautious. Leather: When you think about high-quality bags, leather is the most often used material that comes to mind. Leather is luxurious and long-lasting in addition to being beautiful and buttery soft to the touch. Leather is also quite pricey compared to the other commonly used materials and can scratch or become soiled easier than other options. Leather is often synonymous with luxury and craftsmanship. As an animal product, leather often receives negative attention. It is extremely durable and feels lovely. Leather is also more expensive than other materials and may scuff or scratch easily if not properly cared for and maintained. Start by thinking about the activities you will be using your new gym bag for. If you play a sport involving lots of equipment such as tennis, you will need a larger or specialized bag. If it is meant to hold your clothing while lifting weights, you may want to select a smaller option. Will your new gym bag be pulling double duty as a carry on or travel bag? If your answer is yes, you may want to go with a more durable option since it will be used more often. Many gym bags include a separate pouch or kit to store toiletries, which is another beneficial and useful feature for frequent travelers or those individuals facing long commute times. There are many different styles relied upon by designers. 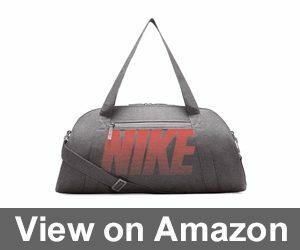 Here is a detailed explanation of the various styles that are the most popular and commonly used in crafting gym bags for women. Messenger Bag: Messenger bags have become a very common style. They are sometimes referred to as over the shoulder bags. The bag consists of a centralized pouch for storing your items in addition to supplementary pockets for organization. If you like messenger style bags, try to select one with adequate shoulder strap padding to increase comfort and prevent sore shoulders. Tote Bag: A tote bag usually has two straps and is carried by one hand. The bag may or may not have a way to enclose the top to prevent your items from falling out. This type of bag is great for shorter distances or also using when grocery shopping. Duffle Bag: A duffle bag is the classic gym bag style. This type of bag usually consists of a larger compartment and several smaller pockets for storing smaller things like a water bottle, keys, or maybe some after work out snacks. They may be hand carry style with two smaller handles or might include a shoulder strap. Duffle bags are great not only for the gym but also for use on vacations. Backpack: Backpacks are used for carting around anything from books to sneakers to sports equipment. They are worn on the back, freeing up your hands for a multitude of activities. A backpack style gym bag is a terrific choice for business professionals that like to keep their laptop, and other essentials close at hand at all times. If your new women’s gym bag is uncomfortable to carry and use, there is no point in keeping it around. Look for adjustable shoulder straps and padding to add extra comfort during your commute to the gym. Detachable straps, hand straps, or backpack style straps can also add to the comfort level of your new bag as well. Let’s take a gander at some helpful hints and tips to assist you in using and loving your new bag. Take advantage of special features. For instance, if you live for yoga or Pilates sessions, invest in a women’s gym bag with straps to hold your mat. If kickboxing is more your speed, look for duffle bags that have special storage areas for your tape and boxing gloves. Do you have back pain or limited mobility concerns? No worries! There are gym bags that have wheels for trolley style carrying. A bag on wheels can also be a huge help after a particularly grueling weight lifting session. If you love the way a bag looks, but it lacks functionality, skip it. A gorgeous bag is worthless if it can’t hold and help organize your things. Pick a bag that can be thrown in the laundry if possible. They are much easier to clean and care for than those that are not machine washable. Finding the best women’s gym bag for your needs can seem like a fate worse than running for hours and hours on a treadmill. Keeping your budget and preferences in mind will help to keep you on task. Also keep an eye out for bags with features that will be helpful for your favorite activities such as a yoga mat strap or a place to secure your tennis racket, for example. 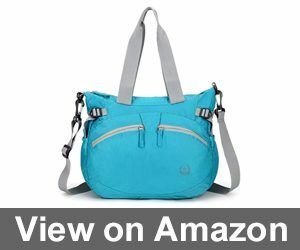 We hope our reviews of the top women’s gym bags was helpful to you today and that you gained some new insights from our buyer’s guide. Nothing makes us as happy as hearing from our readers! Please drop us a quick line below with your favorite gym bags and activities to get fit. My favorite bag for sport is Vooray Burner 16 Inch Compact Gym Bag. I appreciate its durability and quality. Also, the handles are very convenient to carry even very hard sneakers and some bottles of water. I can’t leave without interior pockets, and the problem of my gym bag is that it was a gift. That person didn’t know about my preferences so now it’s a difficult decision for me: to return the money back and buy another one or just hold it ignoring the absence of pockets. I like the size and durability of Coreal Sports Gym Duffle Bag^ I’ve been using it for about 2 years and still happy about its look. Recommend to everyone who likes good of high quality. However it’s not the most attractive option, Everest Gym Bag helps me with my sports equipment greatly. It’s an inexpensive option, that’s why I chose it. Recommend to everyone who isn’t interested in labels and brands but looking for a good durable option. Daniel Smith here, I created 10Luggage to give people a better product insight before they make that all important purchase. Some posts may contain affiliate links. 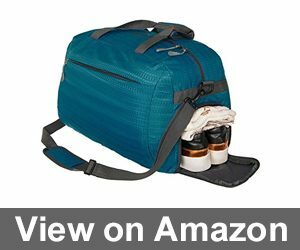 10Luggage.com is a participant in the Amazon Services LLC Associates Program, an affiliate advertising program designed to provide a means for sites to earn advertising fees by advertising and linking to Amazon.com.